We believe in helping children feel successful and learn fearlessly. We do that by creating safe, playful, and inviting spaces that are exploratory, tranquil, and nature based. 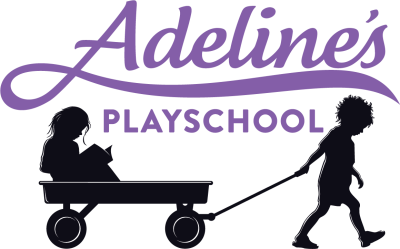 Imagine a place where you can take your child so they can build strong foundations for a lifetime love of learning: Adeline’s Playschool is that place. Research shows that young children learn best in a nurturing, child-initiated play- based environment that fosters self- confidence, trust, creativity, autonomy, decision making, social interaction and acceptance of individual differences while they are actively engaged in activities in which they are interested. Our goal is to provide children with such a place: a rich environment where they feel safe to explore, initiate learning and feel free to express themselves. We are committed to the emergent literacy curriculum which focuses on the natural development of reading and writing skills through activity.We talk to, listen to, and encourage conversation throughout the day. We guide children to problem solve and work out their own problems rather than solving their problems for them. We do this through positive guidance which gives them confidence and opportunities to feel successful. * Natural Playground with fruit trees, a huge sandbox and a mud kitchen! * Individulized curriculum for each child depending on their needs and interests. *Emotion Coaching approach to childrens behavior to help them self regulate. *Dedicated teachers who are working hard on their Early Childhood Education so that they can bring their best to your children. *Healthy and organic snacks served for snacks. *Monthly night out opportunites for families.